Nach dem Apple Kartendesaster gibt es nun endlich eine Google Maps App für iOS. Und wer hat’s erfunden? Ein Schweizer natürlich und zwar Dani Graf. 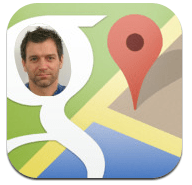 Er zog vor Jahren nach California um die Welt mit kyte.tv zu erobern und ist jetzt Director Google Maps for Mobile – well done! You’re not going to see any menu here, the map is the UI. The map is completely vector based, very fast, and we have the search box on top. Those are the two things Google is familiar with, speed and search. Panning around is super fast, labels appear quickly. You Zoom in, you can pan down with gestures for 3D.